This is a sponsored conversation written by me on behalf of Folgers® . The opinions and text are all mine. Fall is in swing around here. The kids have been back in school a few weeks which means evenings are busy with sports practices and homework. I’ve started doing some fall decorating and at the kids’ request, fall baking too, like my pumpkin apple bread and apple cinnamon Dutch baby pancakes for breakfast (recipe coming soon)! The perfect pairing to all these sweet treats is coffee! 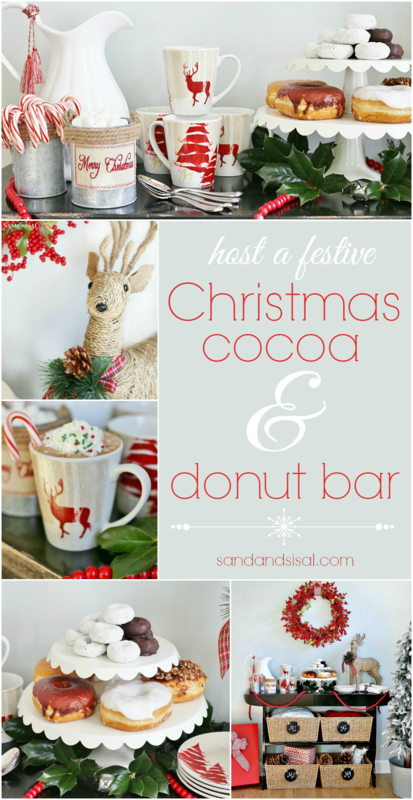 I love my coffee so much that I wanted to show you how to create a cute and festive fall coffee bar ready for entertaining or anytime you need to take a coffee break. 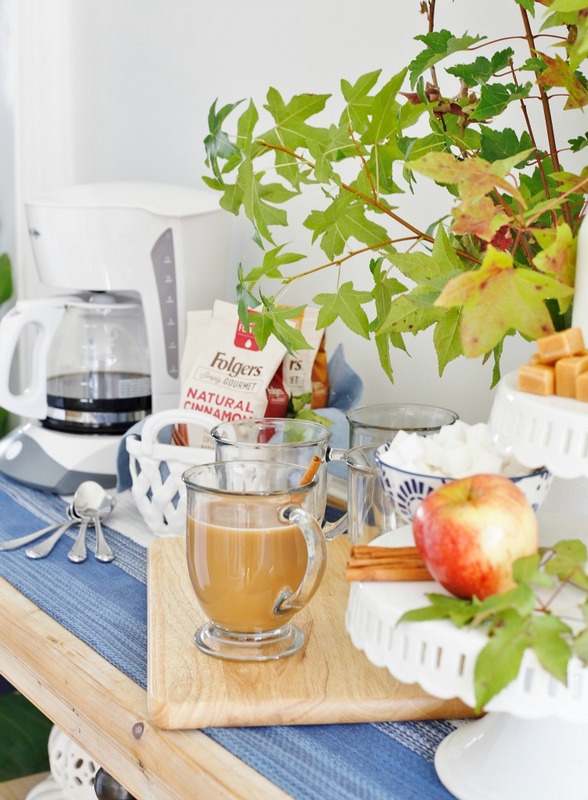 Setting up a fall coffee bar is easy. 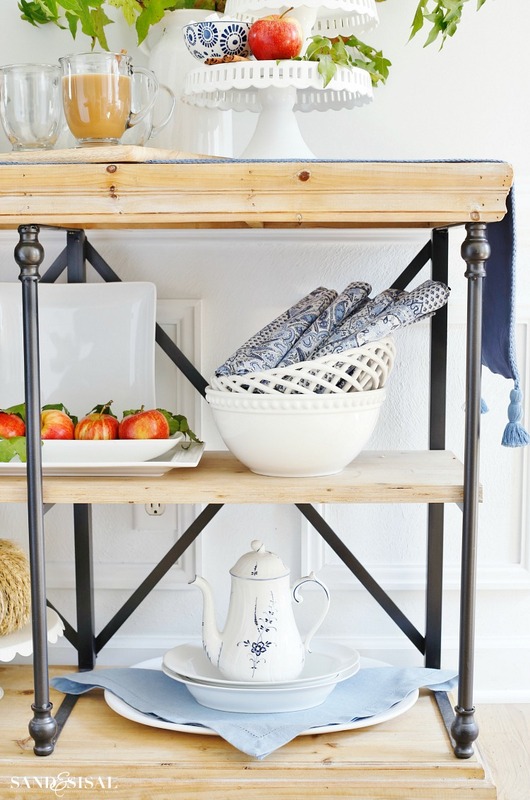 You can create a small coffee station on a counter top or use a buffet or console table. The first thing you will need though is coffee of course! I enjoy a variety of coffee flavors, especially through the changing seasons. 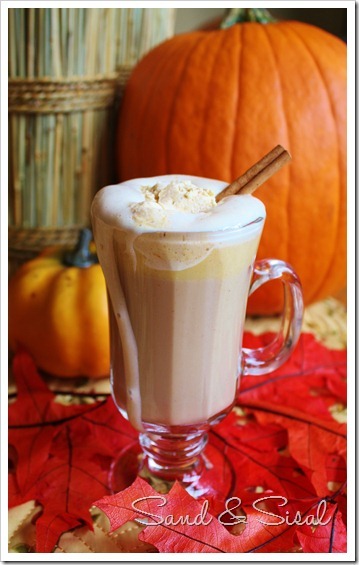 For fall I’m loving warm and cozy coffee flavors like natural cinnamon, vanilla and caramel. Folgers® Simply Gourmet™ just launched 6 new natural flavors of 100% Arabica coffee. They are so good! 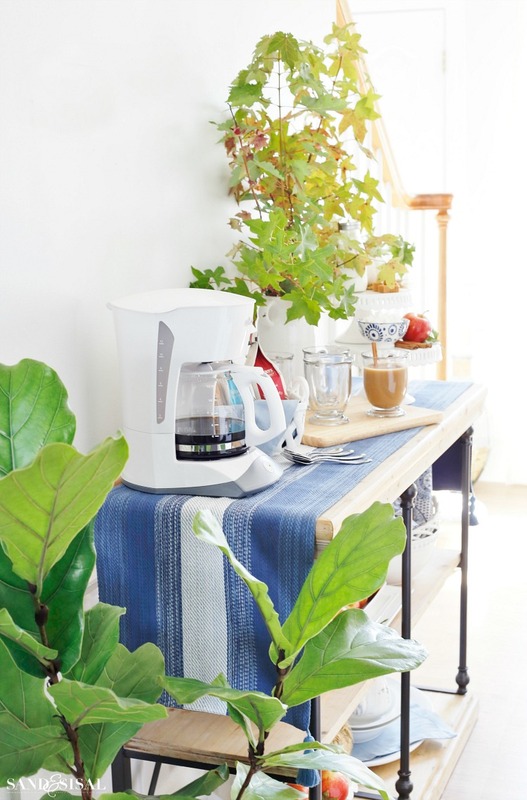 Set up a coffee maker and a sampling of a coffee flavors in a cloth napkin lined basket or bowl. Today’s delicious flavor choice was Folger’s Simply Gourmet Natural Cinnamon. Once I started brewing, my kids came rushing downstairs and asked where the cinnamon rolls were! Ha! Sorry kiddos, it’s mama’s coffee. The house was filled with the most amazing scent of warm cinnamon rolls. The coffee had just the right balance of natural flavor without being overpowering. The next thing you need for your coffee bar are the coffee condiments! 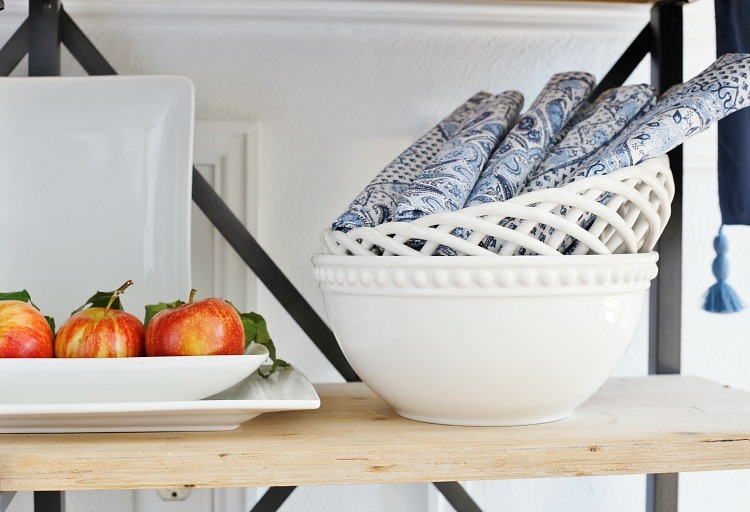 A tiered tray would be ideal here, but if you own one the stacking two cake stands works great too. Instead of a typical creamer bowl, I put the cream in a cute little milk bottle. We drink half and half in our coffee. 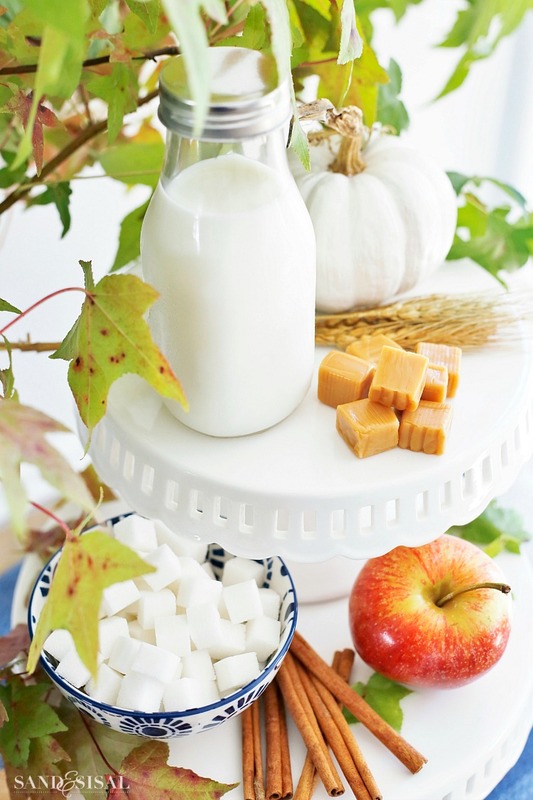 If you are entertaining, be sure to offer a few creamer choices like skim milk and almond milk. Instead of plain sugar, up the fun factor, and offer sugar cubes instead and even sweet caramel for those who really want to indulge. Cinnamon sticks make festive stir sticks and elevate the spicy cinnamon scent. Blue and white is a color theme which can easily work no matter what the season. 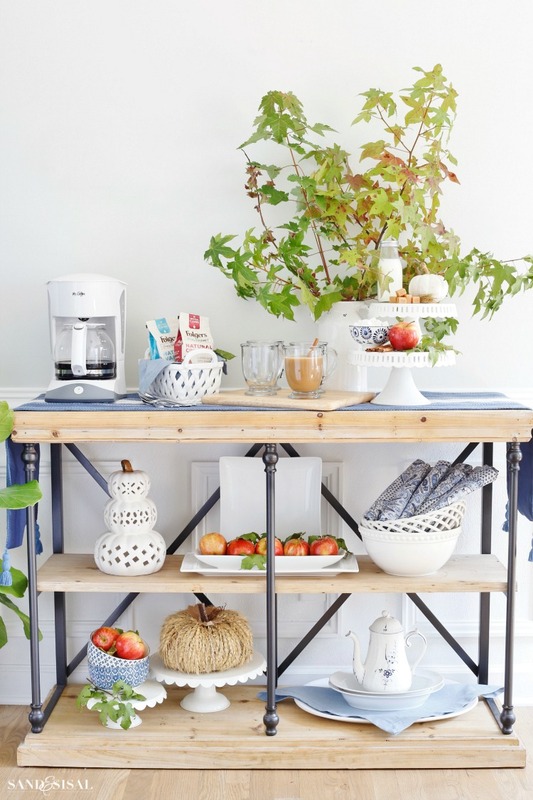 This blue and white fall coffee bar brings in bright red, ripe gala apples for a simple pop of fall color. Have napkins available for those who desire one. I rolled some blue paisley cloth napkins and stacked them in a ceramic serving bowl. I brought out a vintage coffee pot which was a wedding gift. If entertaining then I would serve the coffee in that instead. Isn’t it cute? The little acorn on top of the lid is adorable. Consider adding a bowl of sweetened whipped cream for an extra special indulgent cup of coffee. 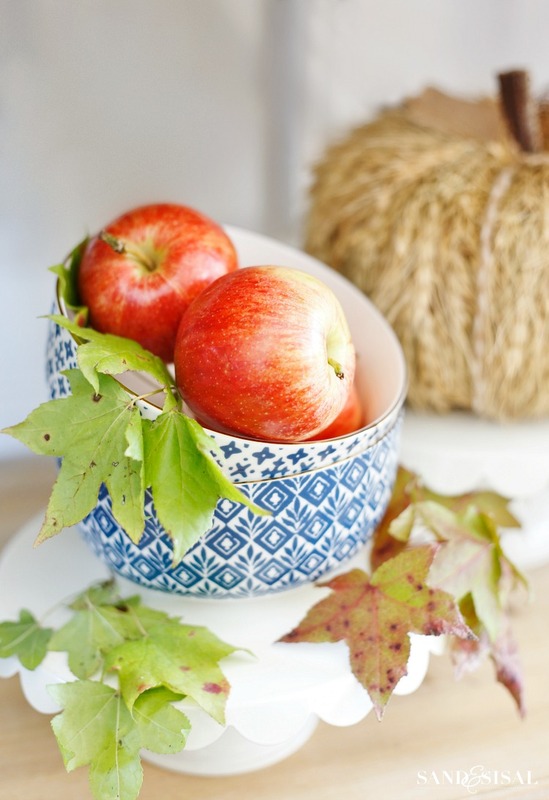 For more pops of color on your fall coffee bar, fill simple cereal bowls with apples and maple leaves. I always love to decorate with what you have. Go outdoors and take clippings from the yard…. or um…. your neighbor’s yard. Those gorgeous maple leaves came from my neighbor’s yard. It’s ok, they moved out and the house is sitting empty. Hey, someone should enjoy them, right? LOVE IT? DON’T FORGET TO PIN IT! I hope you consider setting up a fall coffee bar for entertaining or just for your own pure pleasure. You deserve a coffee break! Get ready for more coffee deliciousness! 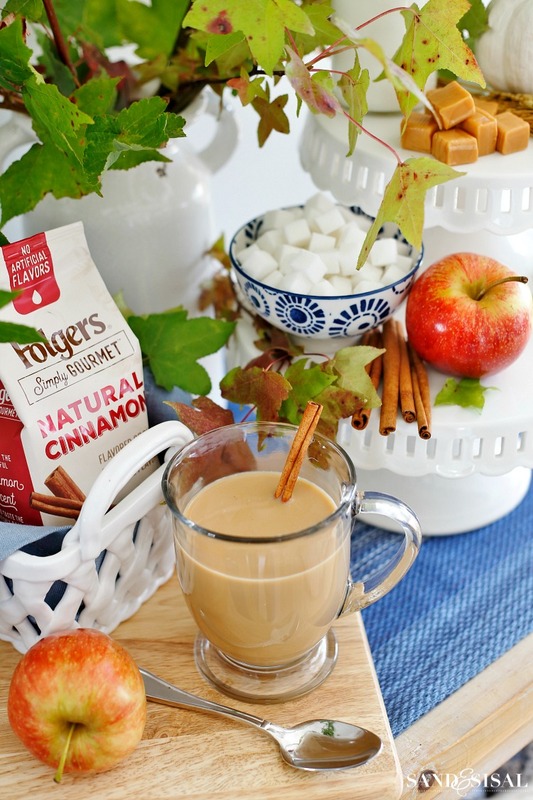 I’m excited to announce that I’ve partnered with Folgers this year and I’ll be bringing you more easy coffee entertaining ideas and recipes. Feel free to check out all the yummy flavors and recipes HERE or on Facebook and Twitter. Thanks so much Kim! The console table is from Kirklands. I think they might still have it in stock too. 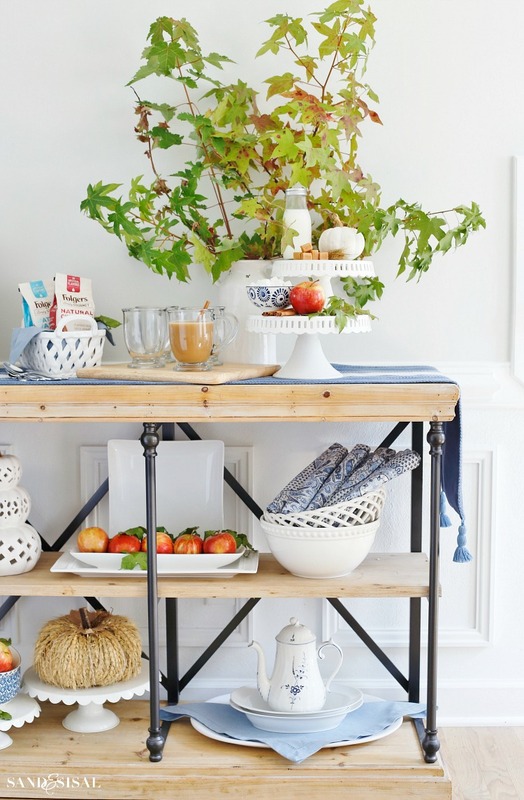 Love the blue and white theme – so classic! Very simple but effective idea, I really appricieate it.